I came across a terrific piece of edited video, called a ‘supercut’ (defined by Slate Magazine as “a video mashup that focuses on a specific word or element in a series of videos and remixes the multiple sources into one video montage”). There are hundreds of these supercuts on YouTube, some of them extremely popular. This particular one collects short scenes from movies that show the ‘back-to-the-camera’ shot. Doesn’t that sound silly? Well it’s not: it’s spectacular, and extremely moving. There’s a HD version on Vimeo, so go on and have a look. I’ll wait. See what I mean? Phenomenal. So many great movies there! This Supercut offers two primary sensory texts: the visual montage, and the musical track. Naturally, one informs the other: film music theory tells us that visuals are there to tell us what to be thinking about, and music is there to guide how we should be feeling about what we’re thinking about. In this case, the framing of the foreground character (usually, the back of their head) instantly suggests that the music is providing the ‘soundtrack of their mind’, and that we’re being offered a synaesthetic sense of their mental engagement. The music starts off as very simple, but soon starts to become more complicated. As it does so, our understanding of the complexity of the characters grows, as well as the true complexity of the scene in front of them. As the music swells, we also understand that we’re also watching an unfolding relationship between the character and the action in the background, which is the true subject of the character’s gaze. Although there are sub-themes that run through the clips (stage performances, Asian landscape, military dominance, doors and window opening, natural cataclysms, etc. ), in most cases the background is spectacle: something wonderful, or awe-inspiring, or terrifying, or overwhelming. As the music grows fugue-like in complexity and repetition, so the emotional scale of the background image seems to grow. At some point we realize there are two spatial levels of scopophilic relationships: one between the character and the spectacle, but another between us and the character. In one early scene (Baraka), the camera pans into the head of the character, but for the rest of the montage, we remain firmly behind the character. Our relationship with the character becomes complex in its own right: are we protected from the spectacle by their foreground stance, or are we being distanced from it? Are we being invited to empathize with the character, seeing what they see, or are we being removed from it by the distraction of the character’s foreground presence? The character is vulnerable, with their back to us, unprotected – yet in many cases the threat we pose to them pales in comparison to the threat they’re facing directly. Their vulnerability is also tempered by their anonymity, since we never see their face. Many of the images, buttressed by the music, communicate a sense of isolation and loneliness. Even with many of the images that show two characters, the engagement of each character with the spectacle in front of them suggests that each is lost in a singular experience, that there is no true connection between them. Towards the end of the montage, it’s tempting to see some hope in the couples shown: Tyler and Marla share some handheld connection in Fight Club; Luke and Leia share a chaste but genuine moment in The Empire Strikes Back. But in both cases, we know better: Marla has fallen for a psychotic schizophrenic, and Luke’s interest in Leia will remain forever chaste – in each of those scenes, the connection is a lie. And yet, there is unity in the montage. The only thing all the spectacles have in common is that they’re all being observed by the character/s. They all share objectification – spectaclification? – since they all sit just outside the character’s immediate orbit. The character is not in their scene, but always just outside it. Only their gaze connects them, and this helps us understand why the music is a non-diegetic soundtrack to their mind: it’s the sound of them trying to figure out what their view means, at the distance they’re at, while we’re using the same music to try to figure out what our view of their view means at the [even greater] distance we’re at. The music is God Moving Over The Face of the Waters, by Moby, who, by the name he gave it, was well-aware of its potential for the profound. The repeated piano motif, which starts the piece and then continues through as a rhythmic counterpoint to the orchestral melody, acts as some kind of kinetic anaphone for (a) the white-cap ‘Waters’ of the track’s title, but also (b) the simple, desperate, and banal repetition of our own merely human lives. When you listen to just that one part, you can hear that sometimes we’re in sync and sometimes we’re out. The orchestral melody, with its deep bass sub-oceanic movements, is the voice of God, hinting at some larger truth . . . some just un-graspable, just outside-our-reach understanding of what it all adds up to, as a singular whole. Here the double-spatial levels of relationship gives a sense of hopelessness: if they can’t figure it all out and they’re that much closer to the spectacle, what hope do we have of true insight, since we’re that much further away? And yet, even from our distance, we perceive and appreciate the beauty of the visuals and of the music, and of their combination . . . so perhaps there’s hope for us after all. Perhaps we need that distance, that perspective. Lastly, if nothing else, it’s a great clip to remind us how cool Event Horizon looks! Time to dust that one off for a revisit. Each country or region has its own specific dish, cuisine or just product to be proud of. And it is nice to be this way because otherwise planet Earth would be the most boring place in the universe. Italians have their developed coffee culture although they don’t actually produce it, France is top-of-mind in wine industry while some other countries are not worse exporters, and in Japan together with the famous sushi they have highly venomous fish as a delicacy. The Balkan countries have a lot in common in terms of food and drink in spite of their different languages, religions, and the unequal access to the sea which characterises this part of Europe. For instance, the population consumes bread in very large quantities. not something especially significant in itself but it bread does provide some interesting cultural by-products. What is curious, however, in the segment in question is packaging. In last couple of years the waffle business in Bulgaria has become, just like the Internet, a platform for information democratization in a highly socio-semiotic manner. 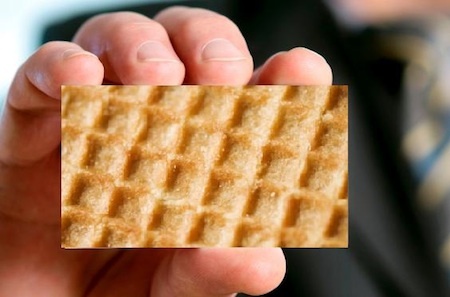 Since production is relatively cheap, almost anybody could invent and launch his/her waffle brand (mainly by outsourcing) in order to say something to the world by means of packaging. Sometimes brand names are ironic and mocking (addressing particular people or a nearby town micro culture) or a modern pun, but certainly tending towards the ubnconventional. The communication power of packaging nowadays is well known but we always talk about its commercial side because it is supposed to sell better. Small regions, towns or even groups of people have the opportunity to express their social or political position by waffle packaging along with funny names and frankly stupid messages. Thus, apart from waffles with local names, just like marketers name the local beer or rakia (brandy) brands, we could find waffles called “Vinkel” (i.e. Shaped iron), “Khriza” (Crisis), “Spoko” (Take it easy! – in urban slang), “Jakhuzzi” (Jacuzzi – connected with ‘very private confessions’ of one local fake millionaire and show star, calling himself Mityo “The Pistol”), “Boretz” (The Wrestler, which is a play on the name of the leading brand in the waffle sector “Borovetz” and the association of that word with “mug”), “Boiko” (which is the first name of the former prime-minister), “Svejest” (Fresh –even though there are no anyrefreshing ingredients in it), and even “Sotichgol” (Stoichgoal – reminding us of the Bulgaria and Barcelona football legend Hristo Stoichkov) or “Oralni Strasti” (which means Oral Passions and which was banned soon after its launch not because of the ridiculous name, but because of even more absurd and misleading claims on the package such as “It diminishes the stress” and the like. The packaging of thee brands is accompanied by relevant images and usually very expressive colors because each brand (insofar as ‘brand’ is a correct term at all in this case) tries to compete in shouting with the others. Most of them are short-lived but the social effect in terms of buzz generated is a point to note. Considered all together everything mentioned above might remind us of remind us of the Roman principle ‘bread and circuses’ in a contemporary „micro” micro version. One reason for attention attraction is the product’s formal difference in relation to bread itself – another, more impactful, is that the packaging serves as message bearer on an equal footing with the regular billboard. A critical semiotic analysis of the IPL-cricket brand and its implicit code of engagement with its audience/consumers throws up interesting perspectives. IPL was conceptualized by its creators as a hybrid concept for a country and audience that is very open to hybrids that mix up very different elements into interesting mixes and cocktails. So IPL was a version of the T-20 format of cricket that blended cricket with Bollywood style entertainment and American sports management concepts of league teams owned by business people, with the cheerleaders thrown in for good measure. With the scandals and excesses increasing year by year, after the sixth season, it might be helpful to use semiotic thinking to decode the very identity of IPL that lends itself to such; more importantly, how would audiences and fans be impacted. Can semiotic thinking shed some light on these aspects? From the mass Indian audience and fan’s point of view, what is IPL-cricket? Is it a sport, a game viz cricket? The implicit but well understood culture and category code of a sporting fan’s engagement with the sport of his choice is of fair play and faith that the game is not rigged in any manner. In any sport, the rules of play are well defined, there are rule-enforcing policemen viz the umpires and within that framework, the contestants – the top sportsmen, high performers that they are, play to win. So, from a ‘sport’ framework, spot fixing and allied match fixing with the brazen involvement of the underworld and cheating sportsmen are anathema. All sports, everywhere, have their scandal stories when big money is involved, along with the fallen idols. But it is understood that the ‘governors’ of the sport will do what it takes to clean up the game of the ‘sleaze’ so that the sports’ fans and sports lovers can enjoy their beloved game without loss of faith or doubt. The credibility of the sport cannot be compromised, else all will be lost. Or is IPL-cricket, cricket really? If it is cricket-ainment, then does it belong with other forms of televised entertainment and thus virtual realities? In the world of entertainment, everything is make-believe anyway. Even ‘reality’ shows are staged and ‘live’ performances are pre-recorded. The audience knows this and aligns their expectations accordingly. In the ‘entertainment’ frame, everything is staged and created for effect. Why not the matches too? Why not have the matches strategized and co-ordinated to keep the audience guessing and waiting for more, like the script writers do for TV content? And if the sportsmen are akin to actors and stars performing their part in a pre-arranged script, then how does it matter if they cut a side deal for a little bit of spot fixing, for some thrills and extra cash? In a strange way, there is no cheating or dishonesty or problem with the brand, because the brand is delivering what it promised to its audience, viz, entertainment to the max – with sideshows of scandals, controversies et al to add masala and spice to the entertainment. After all, it is showbiz and in showbiz notoriety and infamy sells as much as genuine performance. Or as a hybrid – that is a mix of both sport and entertainment – like cross-cultural marriages, fusion food and fusion music, does it have its own rules that it should be evaluated against? Then what are those codes and rules of engagement for a hybrid? Clarity of identity and transparency in rules create simplicity of understanding and consequently trust. That the transplanting of American concepts into the Indian soil creates all sorts of confusion and unanticipated outcomes is clearly evident from the six seasons. Cheerleaders become equivalents of item girls in movies, but when required to perform live in public, need to adopt public behaviors that fit in with Indian cultural standards of modesty in public places. American style free market capitalism in the management of the economics of IPL-Cricket, when transplanted into India’s unregulated or lightly regulated sports market has led to visible and gross excesses of cronyism that gallop unchecked. In economic terms, clarity brings efficiency via simplicity. The first value add of branding to a marketed product is to create a trust mark that its consumers can rely on to define their expectations so that they can know for sure that they have got their money’s worth. Or as a TV audience, they have got their time’s worth. In a world of consumer choice, when the consumer-audience wields the power of the remote control, clarity in defining the brand’s identity, the category classification that it belongs to and hence the codes/rules of engagement with its consumer become a necessity, not something that can be denied, overlooked or glossed over. Declining viewership ratings may be the first sign of an underlying, fundamental identity issue which has not been addressed. Semiotic thinking can lead the way to strategic brand management. You are currently browsing the Semionaut blog archives for June, 2013.